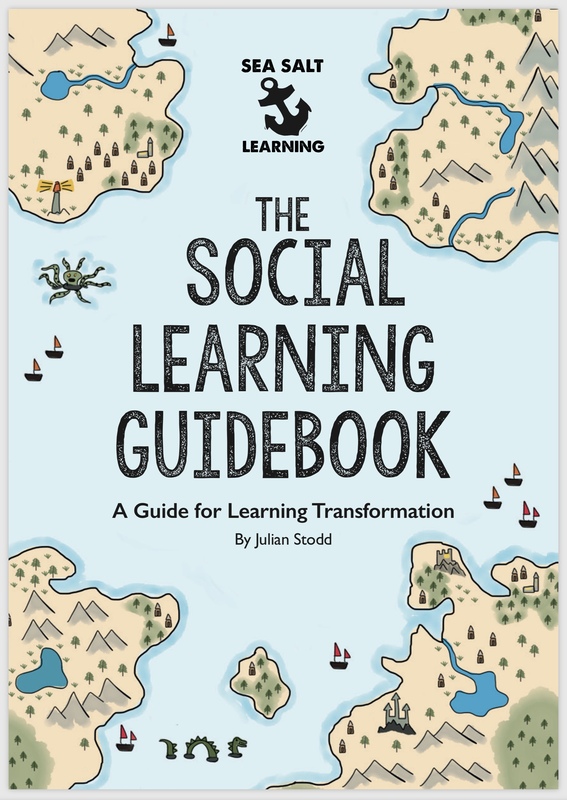 You can download my new Guidebook on Social Learning here. It’s intended to form a concise, practical, guide for practitioners who are trying to transform learning, through more social and collaborative approaches. It builds upon work i’ve shared previously, both in long form books (‘Julian Stodd’s Learning Methodology’, ‘Welcome to the world of Social Learning’, ‘Learning Technology’, and so on), as well as numerous articles on the blog (including this is key ‘Introduction to Scaffolded Social Learning‘). For some time i have been considering writing a full book on Learning Transformation, but two factors have prevented me: firstly, time, and secondly, uncertainty. My time is currently taken up with half a dozen writing projects that are progressing well (‘The Change Handbook’, ‘The Social Age Guidebook’, and ‘Apollo: Leadership Lessons from the Space Race’ among others…), and uncertainty, because my work around Learning Transformation, and the core emergent skills, is still evolving rapidly. But there are plenty of ideas that i wan to get ‘out there’, without waiting to write a full book, so i’ve been playing with these ‘Guidebooks’ as a way of bridging the gap between the blog, and a full manuscript. Taken together, they form my exploration notes for various aspects of the Social Age: a diverse, and evolving, body of work, growing directly out of my primary writing and research, as well as my applied work with Sea Salt Learning. ‘The Trust Guidebook’, is already published, and ships with ‘The Trust Sketchbook’, but i may well make a free version of this in due course. ‘The Social Learning Guidebook’ you can download here. ‘The Community Builder’s Guidebook’ will be published freely in a month or so. ‘The Social Age Guidebook’ will follow, as a sketch map of key strategic challenges i see. ‘The New York Dereliction Walk’ is published, but just provided hard copy on request, but i would like to move this to a full publication: it was my favourite writing from last year. I will build the series out beyond this in due course, but all of these Guidebooks will iterate over time, to form cumulative bodies of work, but freeing me up from the time needed to try to rationalise them into one coherent book. The ‘Guidebooks’ are all written to be under 10,000 words, allowing them to be read fast, and include sections for ‘What you need to know’, and ‘What you need to do about it’, after each short chapter. In that sense, these are aimed more directly at practitioners than some of my longer form books, but there is a lot of cross over: there are a lot of big ideas in here, but i hope also a lot of things that you can action this afternoon! These Guidebooks are not complete work, nor are they definitive ‘answers’. i cannot stress that enough: i am holding comfort in the fact that they are not perfect, but they are shared openly. But i hope they will inspire you to find your own answers: they will iterate over time, so do go back and check your version number to access the latest thinking. I adhere to a methodology of #WorkingOutLoud, whereby all my work is shared openly, and as it takes shape. Where possible, i try to identify which bits of this work are stronger than others, and i share my mistakes and evolving understanding as well. The Guidebooks are grounded in my professional work through Sea Salt Learning: a global partner through change. Sea Salt Learning lets me engage in some of the key strategic challenges our time, with some of our most incredible global Organisations. I am lucky to be immersed in a community of people who want to drive change. This holds my thinking, and work, to account, in a very direct way. It is to that community that i am directly responsible. If you enjoy my work, please consider sharing it: the work in these Guidebooks is shared openly and freely to provide one perspective on a complex challenge. This entry was posted in Writing and tagged Books, Free, Guidebook, Learning Transformation, Publishing, Sea Salt Learning, Social Age, Social Learning, Writing. Bookmark the permalink.